Halloween and Dark Tales: What Inspires You? Here we are in October, my favorite month of the year. Soon the leaves will be turning that crisp brown, gold, and/or burnt orange color and will be falling off the trees into large, inviting piles just waiting for some giddy child (or a silly adult such as myself) to jump on in ‘em. But the best part of October is Halloween. The costumes, the candy, the haunted houses and hayrides – I love it all. Even better, most stations this month will be running horror movie marathons leading up to the 31st so there will never be a shortage of things to watch to send a subtle chill up your spine and keep you up at night. I’m working on my next micro collection of dark tales for release around Halloween and while brainstorming ideas, I realized something I hadn’t thought about before: most of my stories are inspired by film or television, not by the horror fiction I grew up reading. As my bio stated, I lived for Stephen King novels as a kid. I remember being six-years-old going to the library every weekend with my mom and brother, heading straight back to the horror section and bypassing all the children’s and middle grade literature. I’d read the back cover copy on his older books in the section, read the jacket flaps, and if the cover was frightening or strange, I’d put it in my “to read” pile. Once I had an armload of books, I’d head on over to the librarian at the circulation desk and plop my bounty up on the counter, sliding her (because it was always a female working the desk) my library card. She’d look at me, then up at my mother, then back down to the titles I’d laid out for her, then back at mom. Mom would just shrug and say, “She likes scary stories.” The librarian would sigh, shake her head, and check out the age-inappropriate material, handing the books to me with a concerned and bewildered expression on her face. I’d smile, thank the judgey librarian, and happily jog out to my mother’s car, cracking open one of the tomes to read on the short ride home. Movies, however, seem to have had a greater impact on me and my sensibilities as a writer mainly because they operate on a visual level. I’m a visual person. Images I see get burned into my mind and never leave (seriously – I have almost perfect recall of things I’ve seen, and been horrified by, as a child) and while I’m writing, these images come to the forefront of my mind and inform the tone of whatever it is I’m working on. For example, in Dark Tales: eVolume One there’s a story called “Child’s Play” about a young boy and his imaginary friend who might not be quite so imaginary. After I wrote it, I came upon Thomas Ligotti’s short story “The Frolic” and was surprised by how similar my ending of “Child’s Play” was to his – but not very. Because ultimately, my ending was a take off a Tales from the Crypt episode I’d seen as a kid called “And All Through the House” (and I hadn’t consciously intended to do that when I sat down to write the story by the way). I won’t spoil the endings of any of the three stories mentioned here, but needless to say, I think Ligotti and I must have been inspired by the same story (remember – Tales was a popular comic book series in the ‘50s and ‘60s and “And All Through the House” was taken from the source material). The image of a deranged serial killer standing in your house dressed as Santa, drenched in blood is a powerful (and chilling) one. As is a woman screaming. These images are perfect jumping off points for a horror story. 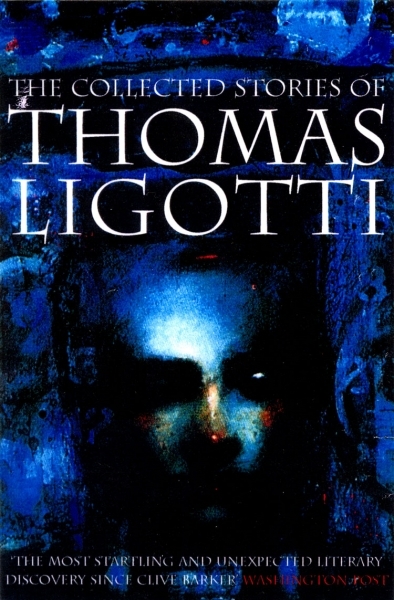 I don’t have any hard proof Ligotti ever read the comic (and his short story was written before “And All Through the House” was filmed for the Tales HBO series) but it wouldn’t surprise me if he had seen the comics as a boy and had been partially inspired to write dark fiction because of it. Since I know now that I create based off things I’ve seen, TV shows and films that have stuck with me, I wonder – does anyone else do this? And I’m not talking about writing fanfic; that’s a whole other issue. What I mean is, does anyone else unintentionally write a story and then go back, read a book or watch a movie and think, Gee, I think I might have cribbed that totally awesome idea I had earlier from here? I’d love to hear from writers of any genre on this, but especially horror/dark fiction writers since the genre we write in oftentimes tends to be a bit more graphic and atmospheric than others. Donate and Help Indie Spirit Press Authors Produce More Books!